My father, Al Lapides, died last year. He taught me a lot, and set a pretty high standard to try to live up to. Maybe the most important thing he ever taught me was to “brake before the curve, accelerate coming out.” First, it’s a good driving practice. If you hit the brakes while you’re in the curve, there’s much more likelihood of losing control of the car. Second, it’s a life philosophy. When you see a curve coming, when you see the unknown coming, be under control and leave your options open. Then, once you’ve seen the curve and know which line you’re going to take, hit it. Commit to it. Accelerate. A turning point in my father’s life, and in my life, came between my 11th and 12th birthdays. In that time he quit his big company job, joined my uncle in an executive search firm (which was just the two of them), and he, my uncle and a friend of theirs started another company. Just for kicks, my father and uncle also started a wine appreciation club, led by a local wine merchant/distributor, to learn more about fine wines. Talk about accelerating out of the curve! As I look back on this time, a few lessons were absorbed in my subconscious, the first two more quickly than the third. 1)	Working for a large company can be stressful; being your own boss means more pressure, but less stress. 2)	Starting your own company is a lot of work. The company started by the three partners was started by an incredibly small investment by each of them, which meant a lot of sweat equity went into it, including from my brother, my sister and I. 3)	Wine can be interesting, delicious and fun. The first two lessons moved from subconscious to conscious fairly easily and quickly. From my first job out of college to my current day job, I have gone to smaller and smaller companies, including being part of high tech startups for the last 26 years. With my current company I am part of the founding group, which took no outside funds, and it was really rough at the beginning. It’s still hard work now, but we’re at least profitable at this point. Wine, the third lesson, took more time. Not that I didn’t drink wine from an early age. I grew up having Manischewitz Concord Grape (or for a change of pace, Blackberry) wine, cut by seltzer water, at Passover seders and other holiday events. Mom and Dad used to have Gallo Hearty Burgundy by the gallon jug in the house. The wine club changed at least the wine in the house pretty quickly. (It didn’t really change what I got to drink.) I didn’t take the time to learn about wine then, only to see that this was something my father was enjoying. Occasionally I got to taste the good stuff, but really didn’t know what I was drinking. As an adult, when I could legally go out and buy and drink wine, I got to develop my palate a bit more. Lori and I have been fortunate to have lived in wine regions: first in the Finger Lakes area of upstate New York, then in the Santa Barbara area, and for the last 20+ years in the San Francisco Bay Area, with the Napa, Sonoma, Livermore and Santa Cruz wineries all within easy striking distance. Visiting wineries was both fun and educational, and a way to see the beautiful areas we lived in. 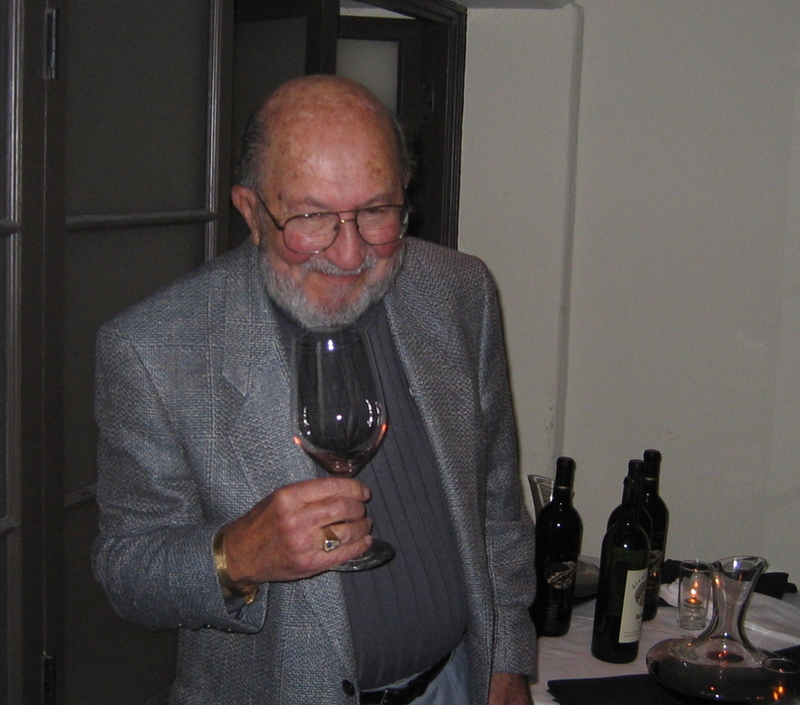 Dad also shared some of his wine when we were living back in California, and could bring a bottle or two home from a visit. One meal I remember clearly is having a couple of my college friends over after we moved back to the Bay Area. Lori cooked a Greek lamb dish, and we drank a 1970 Cos D’Estournel and a 1974 Louis Martini Napa Valley Cabernet Sauvignon. Easily the best wines I had ever tasted to that point. As I recall, at that time (around 1994?) the wines were about the same (11 on a scale of 10), although the Louis Martini did take more time to open up. As a final story I give you my mother’s 65th birthday, where my parents decided to have a sit down dinner at the house, catered by a nice restaurant, for just the immediate family. My parents, my brother and sister and their spouses. As an added bonus, our boys, then 16 and 14, were deemed old enough to join the dinner and share the wine. I can’t remember the meal, but as with the wines above, I have the wine bottles. 1961 Chateau Latour and 1970 Chateau Pichon Lalande. Amazing. 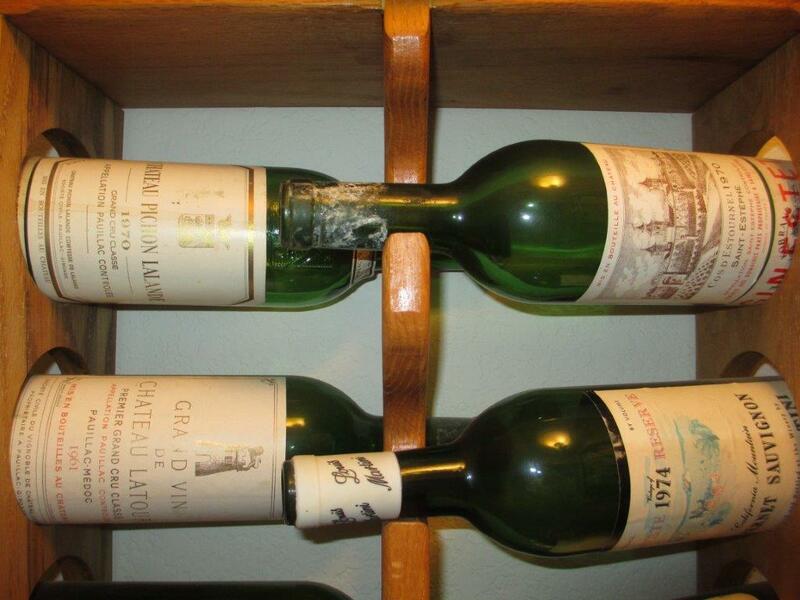 The Chateau Latour is the best wine I’ve ever had, and the other is tied with the wines from the previous story. This entry was posted in wine tasting and tagged Al Lapides, Bordeaux, Cabernet Sauvignon on January 9, 2016 by vvblogman.